Elon University is situated on a 636-acre campus in the Piedmont area of Central North Carolina. News & World Report rated it the 2018 top-ranked regional university in the South. Recently, the university opened its spectacular Schar Center, the home of Elon Phoenix basketball and volleyball, and many other major campus events. 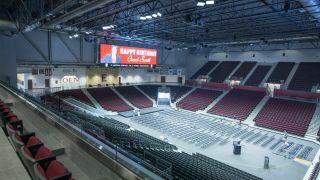 The Schar Center offers a spacious entry atrium, a large practice gymnasium, locker room and team facilities, a hospitality room for social events and gatherings, and of course, the 160,000 square-foot, 5,100-seat main arena. Audio & Light, Inc., designed and installed a state-of-the-art sound system in the arena that is based on a Dante network managed with three Symetrix Edge DSPs. A second sound system, based on a Symetrix Prism 16x16, serves the three locker rooms and weight training room downstairs. "We have been using Symetrix DSPs for at least five years and use them increasingly now that Dante has become prevalent in the industry," said Audio & Light installation division vice president Brian Cox, who designed the Schar Center AV systems. "Symetrix DSPs work extremely well with Dante, and Elon University has adopted Dante as their digital audio transport platform. We also like Symetrix DSPs' sonic quality, and they're really flexible in the way you can control things, what they can do, and how they can route. Symetrix Composer is a very good software package, and Symetrix does a really good job with the user interface. It's easy to configure third-party products in Composer, as well: I used the Linea Research network I/O modules that were already available in Composer to drop the amplifiers right in." One Edge DSP serves as the main input-switching processor, handling both Dante and analog inputs and outputs. "We liked the Edge for that because we could configure the I/O the way we wanted, using three Symetrix input expansion cards and one output expansion card," Cox said. "The other two Edges don't have cards because they're passing everything in and out via Dante." Downstairs and down the hall are the video production racks, where all the analog lines from the floor pockets around the arena terminate to a patch bay. "We wanted to be able to patch in and out rapidly, so we installed Symetrix xIn12 and xOut12 Dante expansion units in the video production rack," Cox said. "We also have Dante primary and secondary switches down there, and they are connected to our Dante primary and secondary switches via fiber connections. We recently had an event where that turned out to be very handy because ESPN needed a PA output feed. In five minutes, I used Dante Controller to patch a feed out and send it to a floor pocket, and they were happy. We also can route audio between components of the Dante network and not have to physically patch them." All inputs, including the Dante feed from the arena's Yamaha console, come into the main routing/switching Edge, which sends it to the other two Edges via Dante. The second Edge DSP is for the north, south, east, and west concourses and auxiliary spaces, which include a donor presentation room, a couple of media rooms, and the restrooms and hallways. "For the auxiliary spaces, we process audio in the second Edge, and that audio goes via Dante to Ashley amplifiers to feed 70 volt speakers," Cox said. The third Symetrix Edge splits signals out for the arena amplifiers. "We have our main EQs in that third Edge, and it heads out to the Linea Research amplifiers for the main arena system," Cox said. For the arena, 48 channels of Linea Research amplification drive a variety of Fulcrum Acoustic arrays, subwoofers, and fills. Audio & Light also purchased a fourth Edge DSP to use as a spare. "Odds are we won't need it, " Cox said. "We have found Symetrix DSPs to be very reliable. But we felt we should have a spare. We have spare amplifiers as well." Cox specified Symetrix ARC3 wall panel controllers for the concourse area and media room, plus an ARC3 at the main rack-and a spare. "So far, the Symetrix DSPs, ARC panels, Linea Research amplifiers, and Fulcrum Acoustic speakers have worked together flawlessly," he said. Downstairs, Audio & Light installed a Symetrix Prism 16x16 to drive a separate system with analog I/O that serves the three locker rooms for Elon's men's and women's basketball and women's volleyball teams, plus a weight training room. Each of the four rooms has a Symetrix ARC3 controller, all powered by a Symetrix ARC PSe power-distribution unit. "The university mandated that we create very good audio in these downstairs spaces so the athletes could play their music," Cox said. "They can send a Bluetooth stream from a phone to the Prism through Attero Tech unBT2A Bluetooth audio wall plates, which also have analog inputs and outputs. The Prism sends the music to a couple of Lab.gruppen amplifiers that drive ceiling speakers and ceiling subwoofers. The athletes just pair their phone and crank it up. They love it."